Its taste is a perfect harmony with spicy and seafood broth and thick noodle. 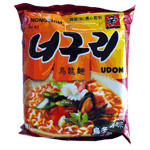 The defining characteristic of this product is it’s thicker than usual ramyun noodles. Anyone who enjoys thick, rich, noodles, will appreciate this product. Neoguri is a perfect combination of spicy seafood soup and plump noodles. Nongshim is proud of its Neoguri and it is currently one of its top products.